Now Available in the Dionysus Mailorder Store! “Tikimentary – In Search Of The Lost Paradise” is an intimate portrait of a charming, eccentric, and mostly cheerful group of friends. Starring: Otto von Strohein, Baby Doe, Shag, Lenore “Tikilicious” & Steve Koppleman, King Kukulele, Marina The Fire Eating Mermaid, Tiki Kiliki, Harold Golen, Sunshine Tiki, Kelly Patterson, Paul Spencer, Nicole & Joe Desmond and the music by The Intoxicators!, Martini Kings, The Bikini Beachcombers,The Tikiyaki Orchestra, and many more! 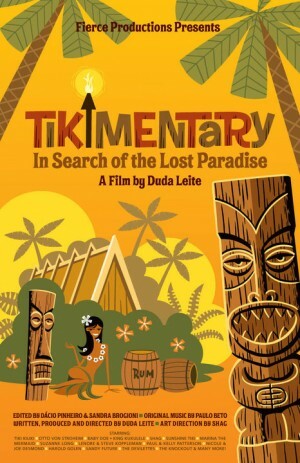 “Tikimentary – In Search Of The Lost Paradise” had its world premiere at The Hukilau 2010 and its West Coast premiere at Tiki Oasis 2010 to large and enthusiastic audiences. Award winning Brazilian filmmaker Duda Leite has always been fascinated by moving images and pop culture. In 1994 he directed his first short film in São Paulo, Brazil, called “Serial Cluber Killer“, inspired by the movies of John Waters and Russ Meyer. This short won the Best Short Film Award at Mix Brazil, got an immediate following and became a cult hit. “Serial Cluber Killer” was also shown at the Outfest, in Los Angeles. In 1995, he directed his second film “Selma & Denise”, a lesbian-trashy punk version of the Hollywood hit Thelma & Louise. It was also shown at the Mix Brazil Film Festival. “After The Fox”, a sing-a-long homage to Surf and the music by Burt Bacharach came in 1999 and was shown at various Festivals around the world, including a special screening at the MOCA Miami. “Resmungo” was his first short filmed in Miami, Florida, in 2005. It was shown at MTV Brazil, and was selected for the Frameline Film Festival in San Francisco, CA. In 2009 he presented “Tikimentary – In Search Of The Lost Paradise” his first documentary and full-lenth feature. It premiered at The Hukilau, in Fort Lauderdale and was shown later that year at Tiki Oasis. “Tikimentary – In Search Of The Lost Paradise” has been show at various film festivals including the São Paulo International Film Festival, Rio de Janeiro Short Film Festival, Mix Brazil and at Otto’s Shrunken Head, in New York City. It won a Special Mention at Cine Mube, in São Paulo.